One of the hydrangeas I chose to buy on my recent visit to the nursery was the Limelight. It is a large growing shrub with dimensions that can reach up to 8 feet wide and tall. The flowers are a pretty white to light green and they are more lacy looking than the ball type hydrangea flowers of the blue hydrangeas I am used to. The limelight is a favorite with brides and they use this flower to decorate everything from their wedding bouquets to wedding cakes. It’s one of the few flowers that is green naturally. 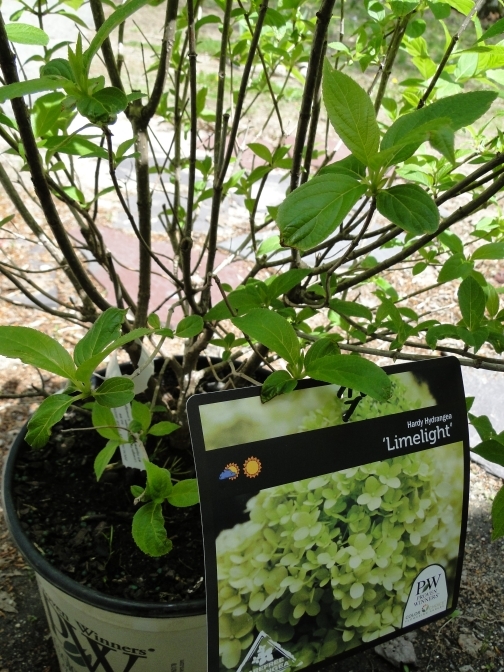 I’ve never grown the limelight (or any hydrangeas), so it will be a new experience, but I am looking forward to watching it mature and bloom. It’s unlikely that I will see any flowers this year as it will be getting established, but hopefully by next year I’ll have gorgeous light green flowers to enjoy. I need some photos of this flower to use in my wedding stationery line so it would be wonderful to have them growing right in my front yard. For now I will settle for any of the hydrangeas blooming and some of my new plants do have buds. Time to Plant Hydrangeas Folks! Previous Post Time To Plant the Hydrangeas Folks!